Guess who’s turning 35? Happy Birthday Loch Ness Monster! January 21, 2013 7:11 PM / 6 Comments on Guess who’s turning 35? Happy Birthday Loch Ness Monster! Can you believe Nessie will be 35 this year? I can’t. Of course, I am judging the ride’s age with my own as the Loch Ness and I practically are fraternal twins. My birthday syncs up with the coolest, classic coaster in the world and who wouldn’t mind sharing their day with that? I don’t. In fact, I’m honored. 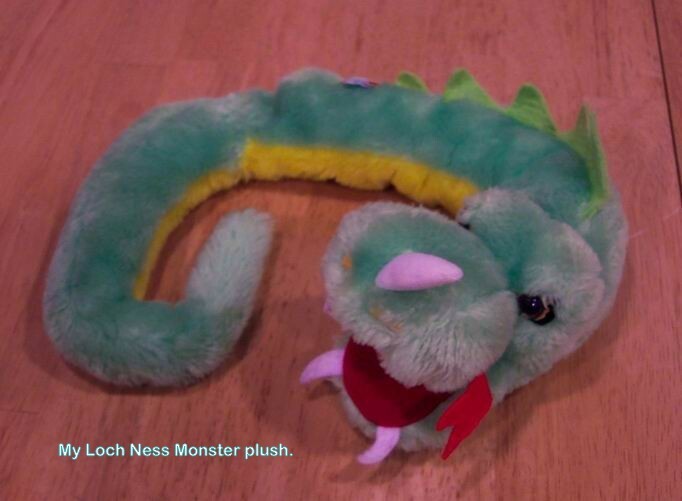 My first memory of the Loch Ness was a powerful one. 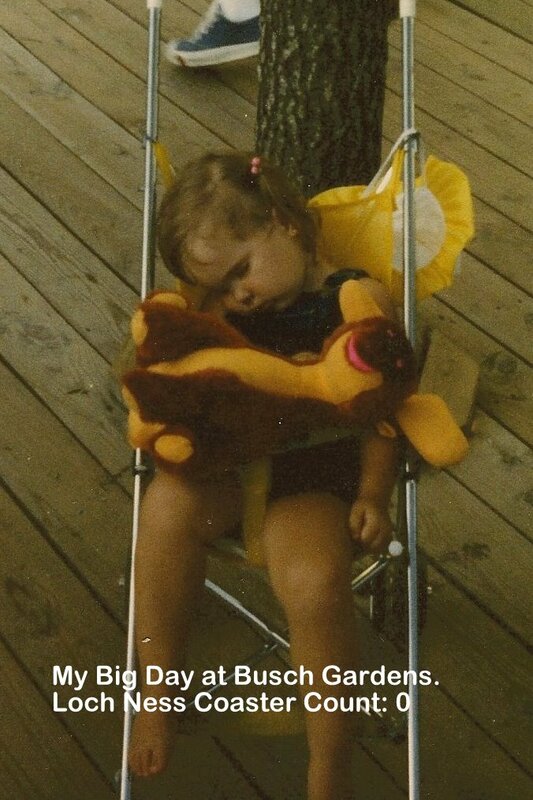 I recall sitting in my stroller and peering up to see a mysterious yellow metal beast way above the treetops. I remember thinking it was the scariest and most exciting thing I have seen in my two and a half year existence on Earth. These odd green metal snakes would climb up to the top and fall off the side towards the lake below. It had to be some magic behind this and I wanted nothing more than to go into that sacred tunnel my mom and brother disappeared into in order to confront this astonishing beast-machine. This reassurance did nothing to appease me. It wasn’t fair. I wanted to ride on that fantastical creature that defied gravity right before me. To me, this was proof that magic existed. I looked over to the kiddie coaster called the Little Nessie. 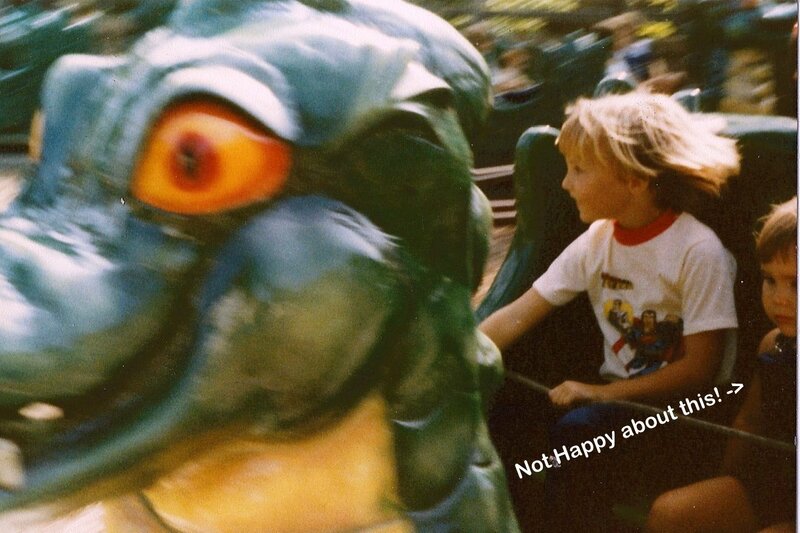 It had a very small circular track that had these little Loch Ness Kiddie Dragon cars that connected in the center to a main hub. The ride would bound around the track going up & down and I suppose for many kids this was a thrill. I looked back at my mom with a furrowed brow. Did she think that this ride would fool me into thinking I was not getting the shaft in this deal? Really? I shook my head and angrily pointed again to the Loch Ness Monster coaster way above me. My mom, frustrated said. “No! We are going to ride the Little Nessie. Come on, you’ll ride with your brother.” And so I did. During the entire ride, all I felt was anger. I stared glaring out into nothing while my brother had the time of his life. Not fair, not cool! I was quickly learning that life wasn’t always sunshine and rainbows. 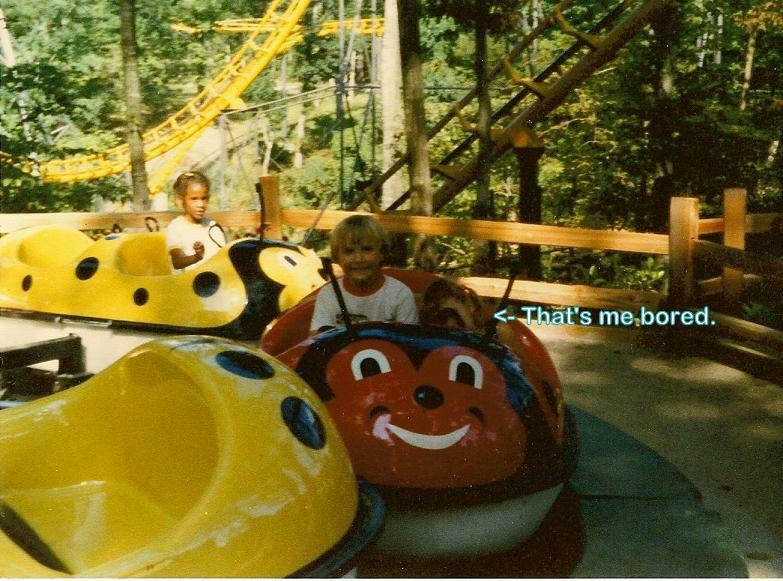 Later that same year, I strategically rode the Lady Bug ride in the old Grimms’ Hollow section of the park just so I could watch the Loch Ness Monster coaster cars fly above me. Every time I saw the cars go by I kept thinking: If only I were older. If only I were taller. It took forever for me to reach that elusive height requirement. FOREVER. Four long years of torture! The whole experience mirrors that of Ralphie’s wish to own a Red Rider BB Gun in the movie Christmas Story. As a kid you seeing that adults have all the power and control and you are just trying to navigate in their world the best you can. Like the BB gun, the Loch Ness Monster was a right of passage; a graduation to the next level of respect and abilities. You couldn’t study in order to pass this test. Nope, you simply had to grow. For a moment I just stood there shocked and not sure if I heard the man right. I’m tall enough? I’m tall enough!! Holy crap did you hear that? My mind raced on the news I just heard. “Mom, mom, mom I can ride it! I can ride it!” I screamed with joy and ran in circles like a dog waiting to go outside while you grab the leash. Heck, I probably was drooling like a dog too. Who knows. I grabbed my mom’s hand and drug her into the line of the coaster. I was SOOOOO excited at this point. I could barely think. Looking around the folks in line I felt so cool! I was now a part of the exclusive club of big kids and adults! My thoughts rambled something along the lines of: I made it, I made it! Oh yeah. Doing my little jig right here in line. I’m cool, I’m awesome. I felt so much older. This was going to be the best day ever. I cannot recall much about the wait in line other than going through the turnstile and seeing the rows for the first time. So this is what the mysterious building looked like on the inside? I thought as the sound of the announcement spiel and the hustle of the ride attendants became mesmerizing. As quick as people got in the cars and the harness came down, the quicker they shot off like rockets into the unknown. My mom asked me what seat I wanted. I had already given this some thought. If you are going to go out on your first coaster ride, go big! “The front,” I nodded with absolute certainty. Mom was hesitant. I had to reassure her several times but she eventually guided me to the line to wait for the front seat. Everything was cool until it was my turn to ride. The gates opened for me to take my seat and I began to feel nervous. What if I hated this? What if all this wait is for something horrible? It was too late to turn back. I raised my chin high and walked through the gates to take my seat in the front car as if I’d done it a million times. Inside my stomach was about to hurl, but I kept it in check. No fear, no weakness! I chanted this to myself and took a deep calming breath as the harness was pressed down onto my shoulders. As if they were harnesses made of Kryptonite, the feeling of being a big kid-adult vanished; leaving me powerless. I felt so small and insignificant in this exact moment. I realized that I was no longer in control; that I have to trust this ride with my life and I was about to fly 60 mph over a 114 foot drop and even be turned upside down! Twice! I squeezed my mom’s hand. “You can do it.” She said with a calm voice. I gulped. The car took off, a slight dip out the station. The little glide through the trees was peaceful and I began thinking to myself that this isn’t so bad. However, when the first car hit the lift chain and I was looking straight up the hill, my thought quickly became: OH MAN, THIS IS WAY HIGHER THAN IT LOOKS FROM THE GROUND! I started to have a mini panic attack. I scanned left and right, keeping my eyes off the top. I could see my dad below, sipping coffee and looking bored. Higher, Higher… click click…clack..clack… Each sound bringing me closer and closer to the top of the hill I had so long wanted to climb back in my Hannibal Lector stroller days. Upon reaching the top I gasped. It was the most beautiful sight I have ever seen. I was on top of the world! I made it! I was higher than anything at Busch Gardens! Suddenly, I wasn’t nervous anymore- I was invincible! “This is awesome!” I screamed. Mom told me to get ready and to hold my arms up. This was it, this was the hill! Over the edge…. My eyes widened… my mouth dropped… words escaped me at view below. Then I felt a sensation of falling; the weight of the car pulling me down, faster, faster, until it all became a blur. The ride approached the second hill and first loop. Down the hill the train went and then all of a sudden, I was looking at the world upside down. This time I started laughing, the smile never faltered from my face. Before I knew it the ride was over. Done. The train pulled up to the station and stopped. All I could feel was electricity. I couldn’t speak; I couldn’t even process how powerful I felt. My mom helped me out and we were walking up the walkway to exit when my mom asked if I enjoyed it. My words exploded into a frenzied mass of syllables. “It was the coolest thing ever! Oh man, that hill… and the loops.. an uh.. and the tunnel was soooo scary!” My dialogue remained on the Loch Ness Monster through six more coaster rides and for the rest of the week. I will never forget the magic of my first ride on the legendary Loch Ness Monster. 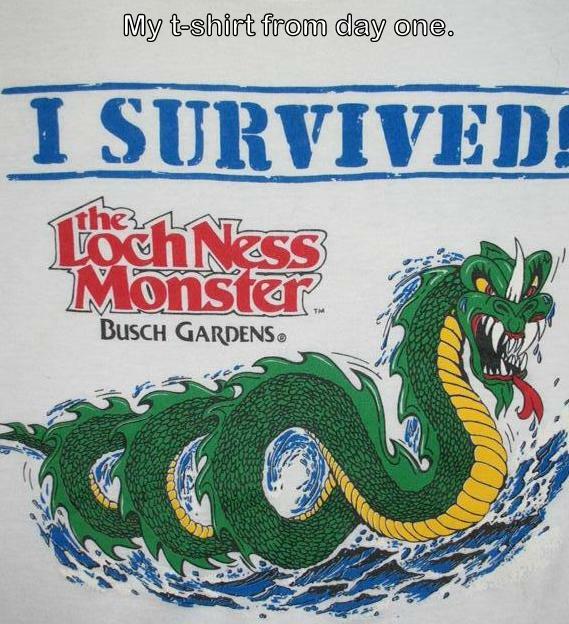 In fact, I still have my “I survived the Loch Ness Monster” button and t-shirt as well as my plush Nessie toy I earned after my brave adventure that amazing summer day. So Happy Birthday Loch Ness Monster! Thank you for all the years of joy and thrills you’ve given me and may you continue to create wonderful memories for decades to come! Cheers! I was still pretty young when The Enchanted Laboratory opened in the old Catapult ride building. In fact, I would say I was the perfect age for the show and found the music quite enthralling. Yep. Even now I can sing the melody to the main introduction and finale of the show; the correct lyrics long forgotten. Yeah, I know. That is not even close to the main theme, but never fear! I’m pretty certain about the details of the show’s story at least. It all starts outside the theater where everyone meets “Northrup the Assistant.” He gathers interest by performing a spiel designed to lure and entice guests to come inside and watch the show. Behind the energetic actor dressed in medieval-peasant garb is a banner that advertises Nostromos the Magnificent who promises to turn Iron into Gold. After gaining everyone’s enthusiasm, the crowd is led into the theater to watch the performance. I can remember the inside of the theater clearly. 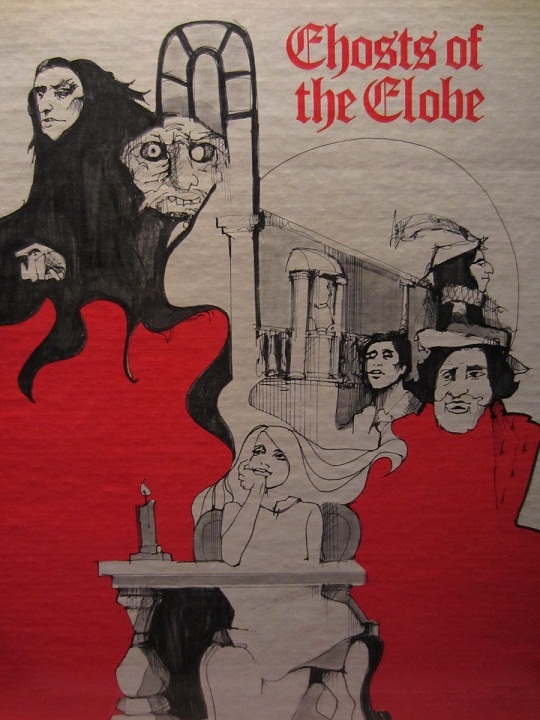 The air was always cold and the scent of dry ice was forever lofting around. Fake candles flicker around the sides of the wall, and the stage is dark and quiet except for peaceful music that relaxes the senses. The assistant Northrup is busying himself around the Laboratory preparing the stage for the arrival of powerful wizard Nostromos, while everyone settles into their seats. 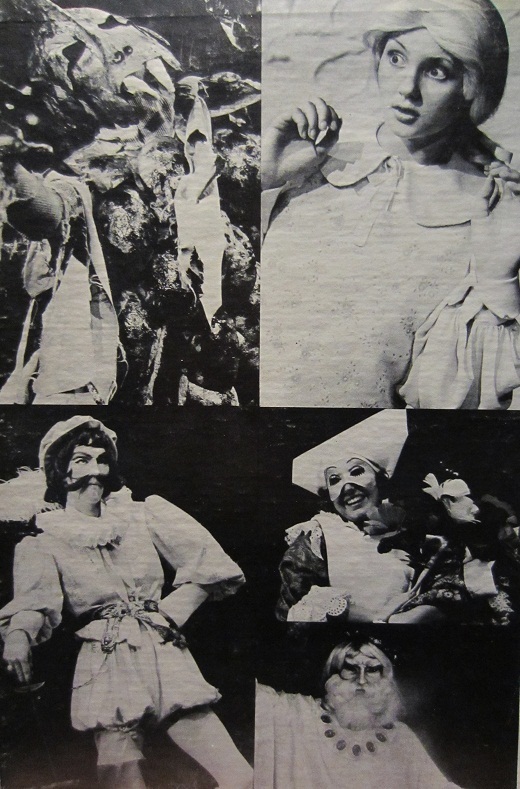 Before summoning Nostromos, Northrup awakens several animatronic characters. There is a wise owl named Pelinore** (my favorite character), a sleeping dog-dragon Talon, and a taunting raven named Elixer. The basis of the show is given right off the start as it is revealed suddenly that Nostromos will not be appearing and it leaves poor Northrup struggling to perform magic for everyone after the main introduction. There were several parts to the story arc. There was an interactive magic trick with two children picked from the audience, a disappearing illusion, a spell that allows Northrup to fly (with its own musical number I may add), and the attempt of turning iron into gold. I would like to insert a brief note that I was called up twice to assist with the trick of a drooping magic wand and the ol’ head in the basket trick. The second time I was savvy to how to keep the wand from breaking which garnered nervous glances from the actor until he bumped me lightly on the arm and whispered “just play along.” Ah~ Good times. The “Iron to Gold” spell was the climax and since Northrup was not ready to cast such powerful magic, much like the Sorcerer’s Apprentice, the spell backfires and suddenly causes the beast named “It” to rise from the floor. The special effects were amazing as the sounds, smoke, flickering lights, growls, and bright flashes of light all made the scene very terrifying and yet tantalizingly fun. Nostromos appears on a screen above the theater and scolds Northrup for misbehaving while he is gone but also praises him for his honesty. Then, as Northrup begins cleaning a suit of armor and wishing everyone a fond farewell, the suit of armor on stage turns to gold when the young apprentice touches it, (by the use of laser projections of course). The show ends with that main theme and the doors opening to allow guests to stand up off the wooden benches and leave the theater. Overall, I would like to stress that the most important aspect of the Enchanted Laboratory was that it was a high-quality production. The music was well done and the whole show inspired my imagination. So, a big thanks goes out to all of those who designed, produced, wrote, built, acted, and created The Enchanted Laboratory. 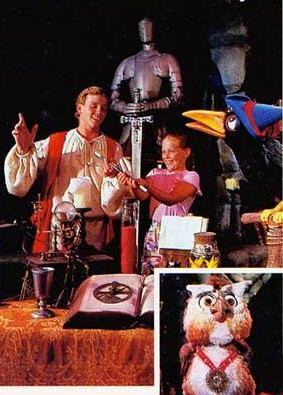 **You know, I wonder where the animatronic owl Pelinore is these days? He always said that “Wavering Faith will not serve you well.” I believe in you Pelinore! 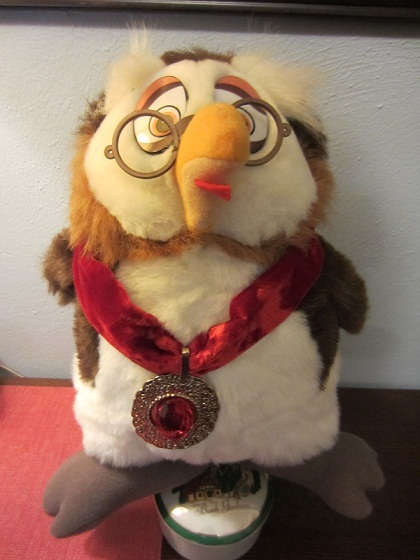 My Pelinore Stuffed Plush Owl.